New Old Technology Gets Things Communicated -- Fast! Send and receive messages in a matter of minutes. Get important materials from business associates, converse with friends, handle your bills practically instantaneously. With the miracle of modern technology, all this and more is possible ... in the 1800s. No, we're not talking about email or the phone, but you are probably still using this fascinating gadget today. Take a look at the clip. What a handy little device to stash in your purse or pocket. I carry my digital camera with me all the time and really like having it nearby. 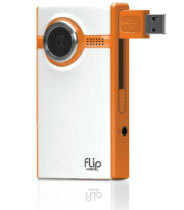 The Flip would be nice for shooting random, everyday happenings. I may go take at look at Best Buy.